Just like any other industry, startups follow trends. What was popular in the last five years is now tired. New cities become burgeoning hotbeds for innovation and new sectors start to emerge. eShares (https://esharesinc.com) is the number one cap table platform and can provide some data to better understand current and future trends. It is building the world’s largest data base of private company valuations. By aggregating and analyzing its data eShares can provide insight into trends in the startup industry. Focusing on median post-money valuations for companies on eShares platform can provide insights on the startup sector. First, we grouped eShares data by startup hot spot. Silicon Valley is still the epicenter of startups but with launch costs declining, and new technology allowing companies to work remotely, other cities are starting to emerge as bigger players on the scene. Silicon Valley remains has the highest valuations across all rounds due to the high number of investors entrepreneurs in the area. No surprises here. Up next is New York, which has leap frogged other tech cities like Seattle and Boston to be the second largest startup community. The large number of investors, industry experts, and a leading VC in Union Square Ventures has helped NYC lead this charge. 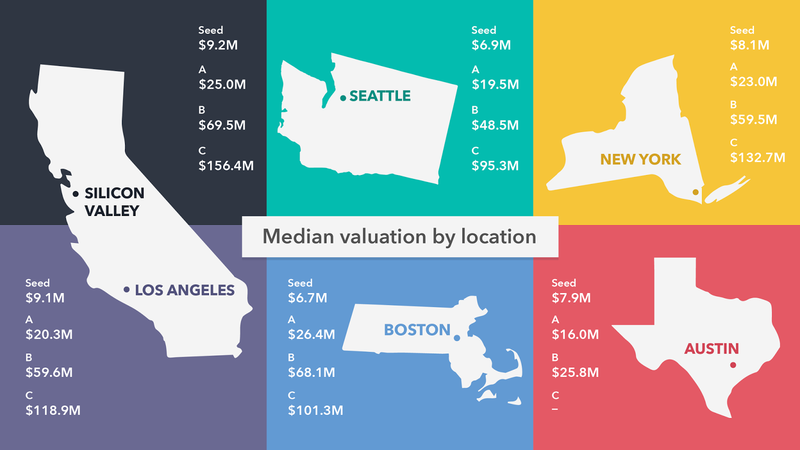 It’s interesting to note that while the median valuation varies widely from city to city, seed valuations for all the startup hotspots are stable between $6 and $10 million. This is due to the rise in angel investors across the nation and the relative ease to access angels, regardless of where you live. Secondly, we spliced eShares data by six emerging startup industries: Adtech, Biotech, Fintech, eCommerce and Digital Media. According to eShares data, Biotech and Fintech have the highest seed round valuations. This is because, Biotech and Fintech companies need large amounts of capital early one to pass government regulations. These industries will spend a lot of money upfront before ever seeing a cent of revenue. Investors understand this and respond with high rates of investment in early rounds, pushing the valuation up. 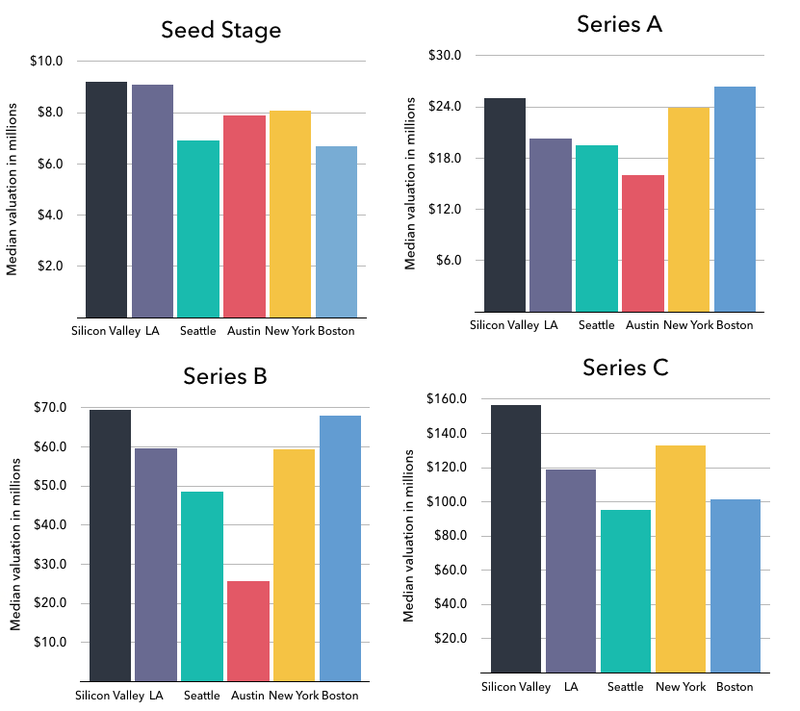 eCommerce has the opposite trend, low seed rounds followed by high later rounds. An online retail business is low cost to start but as the company gains traction, costs to run supply lines and ship product can increase quickly and drastically. This leads to the spike in valuations later on. We did not have enough data for series C digital media. Company location and industry have a pretty good impact on startup valuation. Those trends offer some reference for an entrepreneur looking for evaluating its startup while seeking capital.